Readers of Seneca's philosophic works have long wondered how a sober Stoic moralist could have worked hand in glove with Nero, an unstable, self-indulgent ruler who tried to secure his reign by murdering his rivals. This book explores Seneca's political career and his extensive writings in an effort to understand the disjuncture between the two. The trials Seneca faced, as a committed Stoic caught in a moralist's worst nightmare, able to do good in the public realm only by undergoing private torment, stands as a paradigm of the timeless conflict between individual conscience and political compromise. 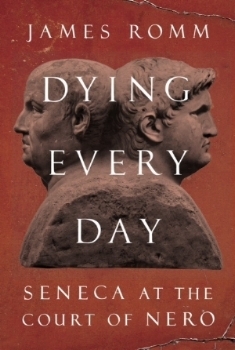 Dying Every Day was selected by the New York Times as one of the 100 Most Notable Books of 2014. When Alexander the Great died at the age of thirty-two, his empire stretched from the Adriatic Sea in the west all the way to modern-day India in the east. In an unusual compromise, his two heirs—a mentally damaged half brother, Philip III, and an infant son, Alexander IV, born after his death—were jointly granted the kingship. But six of Alexander’s Macedonian generals, spurred by their own thirst for power and the legend that Alexander bequeathed his rule “to the strongest,” fought to gain supremacy. Perhaps their most fascinating and conniving adversary was Alexander’s former Greek secretary, Eumenes, now a general himself, who would be the determining factor in the precarious fortunes of the royal family. Ghose on the Throne was recognized as the Choice Magazine Outstanding Academic Title in 2012. Herodotus, widely known as the father of history, was also described by Aristotle as a mythologos, or "tale-teller." Although most ancient historians wrote only about events they themselves had lived through, Herodotus explored an era well before his own time—from the rise of the Persian Empire to the Persian invasions of Greece in 490 and 480 B.C., the heroic fight of the Greeks against the invaders, and the final Greek victory. Working without the aid of written sources, Herodotus traveled widely and wove into his chronology descriptions of people and countries he visited and anecdotes that shed light on their lives and customs. For the Greeks and Romans the earth's farthest perimeter was a realm radically different from what they perceived as central and human. The alien qualities of these "edges of the earth" became the basis of a literary tradition that endured throughout antiquity and into the Renaissance, despite the growing challenges of emerging scientific perspectives. The Greeks, and to a somewhat lesser extent the Romans, saw geography not as a branch of physical science but as an important literary genre. Plutarch was a Greek intellectual who lived roughly one hundred years after the age of Caesar. At home in the world of Roman power, he preferred to live in the past, among the great figures of Greek and Roman history. He intended his biographical profiles to be mirrors of character that readers could use to inspire their own values and behavior―emulating virtues and rejecting flaws. For Plutarch, character was destiny for both the individual and the republic. He was our first master of the biographical form, a major source for Shakespeare and Gibbon. “Mary Lefkowitz and James Romm deftly have gathered strong new translations from Frank Nisetich, Sarah Ruden, Rachel Kitzinger, Emily Wilson, as well as from Mary Lefkowitz and James Romm themselves. There is a freshness and pungency in these new translations that should last a long time. Arrian’s Campaigns of Alexander, widely considered the most authoritative history of the brilliant leader’s great conquests, is the latest addition to the acclaimed Landmark series. After twelve years of hard-fought campaigns, Alexander the Great controlled a vast empire that was bordered by the Adriatic sea to the west and modern-day India to the east. Arrian, himself a military commander, combines his firsthand experience of battle with material from Ptolemy’s memoirs and other ancient sources to compose a singular portrait of Alexander. This vivid and engaging new translation of Arrian will fascinate readers who are interested in classical studies, the history of warfare, and the origins of East­–West tensions still swirling in Iran, Iraq and Afghanistan today. Enriched by the Landmark series’ trademark comprehensive maps, illustrations, and annotations, and with contributions from the preeminent classical scholars of today. Although Plutarch did not intend his Lives as a historical record, they sometimes furnish the best account we have of events in classical Greece. In many instances they are the only account available to those exploring ancient history through primary sources. In this compilation from Plutarch's Greek Lives, James Romm gathers the material of greatest historical significance from fifteen biographies, ranging from Theseus in earliest times to Phocion in the late fourth century BCE. While preserving the outlines of Plutarch's character portraits, Romm focuses on the central stories of classical Greece: the rivalry between Athens, Sparta, and Thebes, the rise of Macedon, and the conflicts between these European states and the Achaemenid Persian empire. Bridging Plutarch’s gaps with concise summaries, Romm creates a coherent narrative of the classical Greek world. Comprising relevant selections from the four ancient writers whose portraits of Alexander the Great still survive—Arrian, Diodorus, Plutarch, and Quintus Curtius—this volume provides a complete narrative of the important events in Alexander's life. The Introduction sets these works in historical context, stretching from the conclusion of the Peloponnesian War through Alexander's conquest of Asia, and provides an assessment of Alexander's historical importance as well as a survey of the central controversies surrounding his personality, aims and intentions. Designed for students with little or no background in ancient Greek language, history, and culture, this new abridgment presents those selections that comprise Herodotus’ historical narrative. These are meticulously annotated, and supplemented with a chronology of the Archaic Age, Historical Epilogue, glossary of main characters and places, index of proper names, and maps.